Nobody can accuse Slade of being subtle. Four screeching and wailing rock musicians from England, Slade rolled into the Oriental Theatre Tuesday night on a wave of frenzied bedlam that must have had the ceramic Buddhas that line the walls of the old theatre yawning with exhaustion. 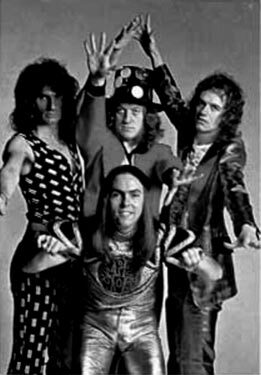 Slade is the hottest rock act in England at this moment, with three songs in the top 10. The group hasn't made it as big in the US yet, but if it does, thousands of American ears are sure to suffer permanent damage. Slade's speciality is whipping it's audiences into something approaching a catatonic frenzy. It succeeded with a vengeance Tuesday. A hard driving pulsating simple rock and roll is Slade's musical fare, but it doesn't stop there. Continual exhortations to the 2,000 young persons who attented the concert to sing, scream, clap and stamp along with the performers had the crowd on its feet and clustered around the stage before the first song was over. At one point, lead singer Noddy Holder, the resident ugly of the group, asked the audience if it was crazy, it answered affirmatively en masse. He then had them chant, "All of us are crazy." truer words have never been spoken. Slade's performance was a slick and professional production. Holder was rather quaint and equipped with a foghorn of a voice. lead guitarist Dave Hill acted slightly demented. He wore glitter on his forehead and in his hair, along with a continual silly grin. Guitarist Jim Lea's speciality was jumping on and off the speakers and amplifiers and gesturing wildly to the audience. Drummer Don Powell, bare chested for most of the act, behaved almost normally. The music was performed well. If unsophisticated rock performed at the pain level of amplification suits your tastes, then Slade is for you.